For Boise to stay competitive in attracting major events and corporate conventions, it’s going to need more hotel space to accompany the convention center expansion and increased business traffic. Otherwise, if there’s no increase in hotel supply, lodging prices will rise (on top of already-high airfares) and conventions and events will be priced out of Boise, taking their business to other cities which offer more space at a lower price. Often, these hotels are funded via a public-private partnership usually through a local option sales tax approved by voters in an election. This sales tax increase only applies to the city or county. A great example of a project funded through a local option sales tax is the BOK Center in Tulsa, Oklahoma. Tulsa voters agreed to increasing sales tax by six-tenths of a cent over 13 years and that revenue source, with some private investment, got Tulsa this magnificent arena designed by world-famous architect César Pelli. I really really hate to go on a tangent, scroll down if you don’t want to read my local-option tax rant…. Frustratingly, voters in Boise and many other municipalities are blocked from being able to vote on funding public projects and other civic improvements with a local option sales tax. I hate this so much. It makes no sense and shackles Idaho communities by giving them very few options in funding infrastructure and facility improvements. You look at the above examples. These are some of the most conservative places in the country, and even they realized that there are in fact cases where you have spend a little money on innovation if you want to make money in the long-term. And let’s say a measure is put forward and Boise voters decide it’s a bad idea and they vote against it. Great! That’s democracy in action! But the fact that the state blocks us from even voting is patently absurd and goes against the ideals of letting local communities choose what’s best for themselves. There’s absolutely nothing “Republican” about this. It’s the definition of obtrusive one-size-fits-all big government getting in the way of smaller communities and their ability to govern. There is a movement to try and change this, but I didn’t see anything in this year’s legislative session which was disappointing. And it frustrates me because it’s not Spokane, or Reno, or Tucson we’re falling behind–Ha! We’re already hitting that stage–it’s Yakima, Pasco, and Wenatchee that we’ll be lagging behind soon if nothing is done. City Center Plaza will help, but even then it’s not going to do us much good if events are priced out of Boise by high airfares and high prices for hotels. In an ideal world, we would be able to vote on a local option sales tax that would help bring our facilities on par for a metropolitan area our size. I think regardless of public investment, a new hotel is on the horizon in some form or fashion. A local option sales tax could mitigate risk allowing for an increase in size, amenities and architectural quality of said hotel so that our beautiful city isn’t uglified by a soulless cardboard box that so many hotels look like these days. Looking at you, Grove Hotel. Let’s try to imagine the Treasure Valley… oh, 5-7 years from now. If the free market just does its thing, I don’t think an increase of 350 rooms in the downtown vicinity is that improbable. Unless there’s a factor I’m overlooking. I won’t pretend to be an expert in the hotel industry beyond a few things I’ve picked up here and there. But for the sake of these posts I’m going with 350-400 rooms as my magic number. Perhaps it could be one 350-room hotel, or maybe two 100-room hotels and a 150-room hotel. From my vantage point it’s tough to say which is in the best interests of the city: As I understand it, one large hotel is most preferable for conventions and large events. Among many benefits it allows them to book many rooms at once and keep everyone in roughly the same location. On the other hand, one large hotel is harder to fill and more risky for developers and operators. It would also mean less competition and less variety in product. Where would a new hotel go? There’s enough surface parking and underutilized lots downtown that there’s no way I could cover all the options in one post. I’ll just go over what, on first glance, strikes me as being most ideal. The first location I’ll look at is the parcel currently occupied by a surface parking lot on the block housing One Capital Center. What the parcel owners want to do with it, I have no idea. But man you just can’t beat that location. The Boise Centre, JUMP, Eighth and Main, BoDo, CenturyLink Arena, Basque Block, One Capital Center–It’s all right there within a pleasant 5 minute walking distance. The only struggle with it is space… it’s not a very large parcel and the ability to add other uses like retail, office, parking, or convention space is limited. A large 350-400 room hotel on this space would require building up instead of spreading out. This would not only give it quite a presence downtown, it could end up being the new tallest building in Idaho. Based on a standard 7-8′ floor to ceiling room height for hotels, a square footage similar to the 350-room Marriott Salt Lake City Downtown Hotel, plus space for amenities, parking and retail, I estimate such a building would be approximately 30-35 stories on this space. Obviously my design is purely conceptual. I figure if I’m going to put this much into creating a massing model, I might as well have fun with it. Ideally any concept like the above would employ measures to keep the building people-friendly and human scaled, including ample space for retail, outdoor dining, and space for trees and natural shade. And again I emphasize that these are all conceptual and more to demonstrate the potential impact that a new hotel, depending on the size and location, would have in the downtown area. 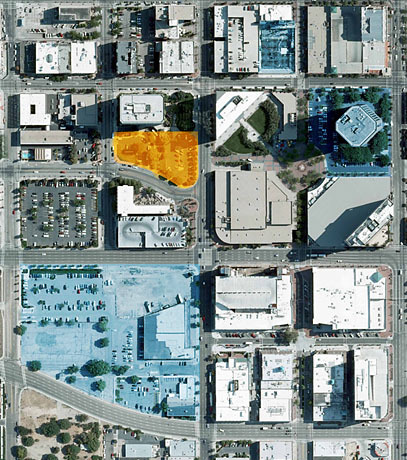 This is getting long, so I’ll do a Part III where I’ll continue to examine more parcels and other ideas for new hotels, including possibilities beyond downtown in other parts of Boise. THIS. Your renderings are fantastic. I am constantly mistaking them for actual proposals, which is frustrating, but totally worth it for the what-if factor alone. Thanks so much for the comment Jared! I get similar feelings when I stumble upon an architect’s portfolio and I see some really beautiful renderings that aren’t real-life proposals. With the level of recent private investment in Boise, you don’t need to worry about sales taxes and incentives for a new hotel. A private developer will come along with the necessary experience and pocketbook. Walt Worthy is building his Convention Center Hotel in Spokane entirely on private funds. There’s no reason to think that a developer in Boise wouldn’t be able to do likewise. My bet is that within the next 12-18 months, a private developer will come forward with a serious proposal. There’s a problem with that placing. It would totally block the afternoon sunlight from the Grove, which is already about to be way overcrowded with the new City Center Plaza (horrible city planning, BTW). We need a public place in the city center that isn’t overcrowded, and yes, Jump might provide that but that’s a couple blocks away. i think that a new high rise should defiantly go up there. Even if it blocks the sun for an hour or 2, it is another big development. I am going to be a future architect and i am only 14. Even i know something big and tall needs to go up there. Maybe a big glass hotel or a sleek new looking business office tower.